When I came to Bandung in 2012, the bamboo revolution was just beginning. This bustling city in the volcano-studded highlands of West Java is a place where local Sundanese culture negotiates with global trends, a city where you can attend traditional ram fights and indie rock festivals on the same day and sometimes even on the same block. The band were disciples of Abah Olot, a musician and instrument maker from Cimanggung, a village in Sumedang not far from the urban sprawl that Karinding Attack called home. Coming from a family of musicians, Abah Olot began consciously developing a Sundanese music workshop and studio in the early 2000s, rooting his work in the karinding mouth harp he had made and played as a boy. While the karinding was traditionally a solo instrument, Abah Olot began crafting a modern bamboo ensemble to flesh out its sound. After Karinding Attack combined this ensemble with the counterculture cool of the underground heavy metal scene, the popularity of these instruments exploded, with dozens of young bands popping up to explore this new Sundanese bamboo metal aesthetic. Sundanese music, and specifically bamboo music, was suddenly cool again for a whole new generation. This was only the latest chapter in a long history of bamboo musical ingenuity. Bamboo has been used for ages as a musical material, and for good reason: it grows fast, is remarkably strong, and its cylindrical shape and noded structure naturally lends itself to the making of instruments like flutes and xylophones. While bamboo instruments are still fairly common across the archipelago, nobody seems to have embraced the material quite like the Sundanese of West Java. Before the bronze metallophones of gamelan made their way to Java centuries ago, it’s likely that people in this part of the world were already jamming away on bamboo. While the refined music of the Sundanese aristocracy came to mostly favor other materials (think of the wooden kecapi, and the tinkling bronze of the gamelan degung), the folk music of the area, especially that played informally, was largely rooted in bamboo instruments from calung and angklung to celempung. The Dutch-era ethnomusicologist Jaap Kunst recorded a number of bamboo ensembles in Java, including a now-extinct variety in Central Java which is remarkably similar to the style now called celempungan. In Abah Olot’s hands, the celempung became the rhythmic heart of this “bamboo revolution.” The instrument is what organologists call an “idiochord,” a technical way of pointing towards the way the instrument’s string is made from the same material as its body. I’ve explained it a few times already in my other posts on idiochords or tube zithers (see Sumba’s gogah, West Sumatra’s talempong botuang, the Javanese gumbeng, and the very first Aural Archipelago post on celempung), but it doesn’t hurt to go over it again: with the celempung, a long, fat cylinder of bamboo (with nodes closing off either end) has strings carved from the outer “skin” of the bamboo and raised/tightened with bamboo bridges. Some celempung have three strings, with one bass string given weight and volume with a little bamboo tab attached to the string (not unlike the bundengan’s bandulan stops!) Others have two strings bridged by a piece of bamboo, with a hole drilled in the cylinder below this piece. When this floating bamboo bridge is struck, the bamboo strings resonate together, their gong-like vibrations resonating through the whole instrument via that little hole. As far as I know, Abah Olot was the first to take the latter variety of celempung and line them up in a row, supported by a frame. He called it the celempung renteng, Sundanese for “row” celempung. At first glance, the celempung renteng looks like an elaborate xylophone, but Abah Olot’s intentions for it was melodic. The original celempung’s purpose, after all, was rhythmic, with the strings mimicing the the sounds of the time-splitting gongs, with the instrument’s end played by hand like a drum. The genius of the celempung renteng was to make a variety of celempung that was devoted entirely to imitating the Sundanese drum or kendang. The kendang is famously melodic, with a wide range of sounds emanating from two or three double-headed barrel drums (melodic effects are achieved by manipulating one drum head with the heel of the player’s foot!). To imitate these famous drum patterns, a celempung renteng player uses soft mallets to hit the ascending tones of the lined up celempung zithers, their bassy sound occupying the same sonic space as a traditional drum. 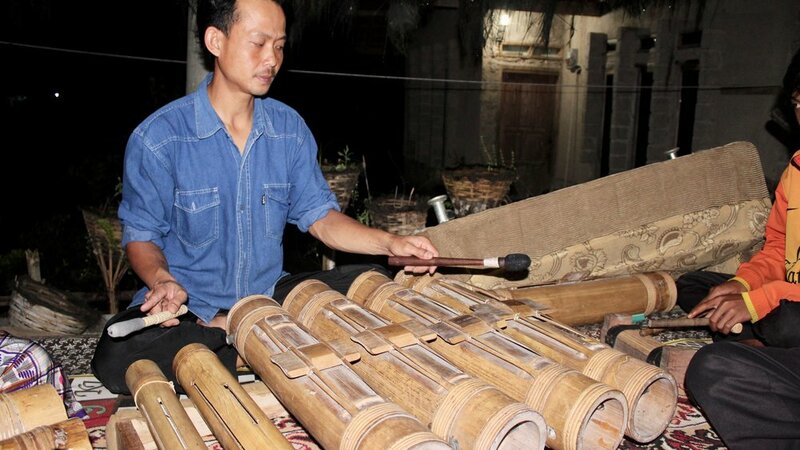 To imitate the drier, high-pitched sound of the kendang’s smaller drumheads (kemprang and ketipung), two slitted bamboo cylinders (slit drums) called kentongan are sometimes added to one side of the instrument. Abah Olot’s celempung creations seemed to be an explosive success: they were everywhere when I showed up in Bandung six years ago. Not only were the instruments cheap substitutions for more expensive drums and gongs, but they had a rustic, organic charm which must have been attractive to a generation of urban Sundanese, folks feeling suffocated by the complications of life in a city dominated by gridlock and global culture. Soon, though, this celempung-rooted style (now sometimes called celempungan, a name once reserved for ensembles featuring the kacapi zither) was finding life in rural regions outside the city, places where the old-school celempung had not yet faded from memory. Some groups, such as those that proliferated in places like Sumedang and Garut, centered their sound on the droney karinding mouth harp which Karinding Attack had ridden to fame, while others let melodic instruments and vocals dominate the new ensemble sound. One such group was Celempungan Gentra Wiwitan, an ensemble from Banceuy, a traditional village in the heart of the Ciater tea-growing region of Subang, just north of Bandung. The area around Banceuy is firmly rural, with the road into the village passing through tea plantations, rice fields, and mountainous pine forests before crumbling just at the village’s outskirts. The urban bamboo revolution, though, had made its way there through Lembang, a neighboring highland resort town with close ties to Bandung. Within a few years of these bamboo bands becoming popular, the amateur musicians of Banceuy were having a go at this trendy new art form themselves. The full line-up of Celempungan Gentra Wiwitan is a fine example of a beautifully fleshed out bamboo music group. In addition to virtuosic celempung renteng rhythms, the group adds a handful of single-string celempung to sub in for the gong parts so intrinsic to almost all Sundanese music. Meanwhile, the metronomic crash of kecrek, traditionally played with metal cymbals but now often played on motorcycle disk brakes (as in nearby tanji and bangpret bands) here finds a bamboo form, with a broom-like collection of bamboo slivers tied into a wooden frame and hit with bamboo sticks. Karinding is an optional addition to the gang, its droney buzz emphasizing the imagined gong parts. Finally, perhaps the most unique addition to Banceuy-style celempungan is what toleat master Pak Amar brings to the table. Pak Amar leads the group not only with toleat, but with a homemade klarinet Sunda or Sundanese clarinet, an addition inspired by the tanji marching band tradition I’ve written about before. The clarinet, and Pak Amar’s clarinet-inspired toleat playing, lends the group’s music an unexpected jazzy quality, with the smooth reedy sounds blending beautifully with the syncopated polyrhythms of the assorted celempung. The repertoire, as can be expected in a neo-traditional group like this, is fairly loose: Sundanese pop songs sit comfortably alongside jaipongan style pieces, with all pieces featuring the characteristic, mostly pentatonic Sundanese scales (salendro, pelog, and sorog) and those characteristically busy kendang-aping rhythms. When the band plays at village events like circumcision parties and village cleansing rituals, they’re ready to take requests, though in contrast to other bamboo groups I’ve seen, they tend to shy away from dangdut, that national pop style which is so beloved in villages across the nation. It seems an intentional move, with “keep things Sundanese” the unspoken rule. What it takes for something to be Sundanese, and what Sundanese music sounds like, is up to interpretation: the “bamboo revolution” shows a remarkable fluidity in the Sundanese musical world. This fluidity is what makes Sundanese music so exciting, with idiosyncrasies abound across West Java. Even in this musically diverse province, though, Banceuy’s celempungan group stands out, a potent symbol of the ingenuity and organic charm of Sundanese musical creation. Banceuy is a village in love with sound. When I first stumbled into the village four years ago, my eyes caught on giant bamboo windmills buzzing high above the rice paddies. These huge propellers, I learned, were called kolecer, and they had no purpose but to make sound, an ambient whir that erupts into thundrous crashes in high winds. People have contests to see who can make the tallest, or the loudest. It’s all beautifully pointless, nothing but a pure delight in creation and sound. Heading to a far-off village in search of music found in a YouTube video is like second nature to me now, but Banceuy was my first experiment in this mode of social media-aided research. I’d seen a video of Celempungan Gentra Wiwitan and had been entranced by their effortless tightness and the casual vibes of their set-up, playing in someone’s living room. I soon found myself wandering into Banceuy on motorbike with Bandung friends Reggie and Tom, asking around about celempungan. I was lucky to ask the right guy: Zezen, a tubby karinding player with a helpful spirit and a solid dose of local pride. Zen led me to Odang, a local leader with prematurely graying hair and a shy smile. Kang Odang, as I came to call him, was happy to see us: he’d been putting a lot of effort recently into promoting Banceuy as a kampung adat or traditional village, a mecca for lovers of Sundanese culture. With Odang as my hook-up, I spent many years going to Banceuy, both for rituals and to record and research the celempungan and toleat music there. Finally, in 2017, I was tasked with leading Belgian producer Dijf Sanders around Java for a Europalia-funded artist’s residency. Dijf is open to all sounds, I soon learned, but he loves the bamboo music I’ve shared on Aural Archipelago. I hadn’t yet shared celempungan or toleat on the site, so I took it as an excellent excuse to make my way back to the village and connect Dijf with the musical world of Banceuy. It was quite a day: I threw Dijf on the back of my humble scooter and we drove into the hills above Bandung, skirting the volcano and rice paddies of Ciater and weaving our way into Cibeusi (the village where I first discovered bangpret.) The idea was to hike into the forest to the Cibareubeuy waterfall, domain of the celempung-playing palm sugar harvester, Pak Rosid. Nothing turned out quite as planned: we hiked through pouring rain only to find that Pak Rosid was actually back in the village where we started, but it was a beautiful chance to show Dijf a side of rural West Java that few outsiders get to experience. We eventually found Pak Rosid, with Dijf making some fresh recordings of the man’s celempung stylings. By the time we were finished, it was already dark, and we were still wet and covered in mud from our hike. We would have just headed home, but I insisted: you’ve got to meet Odang and the gang. It was a relatively short ride down crumbling country roads, frogs barking in the dark as we tried not to get lost at each dim crossroads. When we pulled up to Banceuy’s single street, Kang Odang was waiting outside his house with a smile. The assortment of celempung was already sitting on a bamboo veranda just to the side of his front door, so we wasted no time in settling in on the woven bamboo floor, warming our bodies with hot tea as I introduced Dijf to the band. It was a hilariously tight fit on that little bamboo veranda, five musicians plus two oversized foreigners, but it made for an intimate atmosphere, with Dijf swapping curious questions with the band as I translated. Dijf soon whipped out his recording gear, a set-up far fancier than my own: a fancy ZOOM F-series field recorder with some nice external stereo mics plugged in. With the aim of collecting material for his Java album, Dijf recorded not only full songs, but the sounds of individual instruments, from the celempung renteng to Pak Amar’s clarinet and toleat. The sounds didn’t make it onto the album except for an unedited bonus track featuring the band, so this post is a little way of making up for that. The audio tracks are Dijf’s beautifully produced recordings, and even the video’s sound has been synched with Dijf’s recordings. Dijf told me after our whole Java trip was over that that night may have been is favorite of his whole time on the island. Maybe it was the intimacy of that space, shoved into that bamboo veranda, mugs of hot tea at our feet; maybe it was the beautiful openness of these people, people who knew nothing of Dijf or his motives but welcomed him into their musical world for a while, an experience that I too had already shared countless times in my trips to Banceuy over the years. Or maybe it was that shared love of sound, creative spirits bonding even without a common language.